Vitamins are an essential part of healthy nutrition. All vitamins can be found in food, but certain demographics or people on specific diets can suffer from vitamin deficiency. 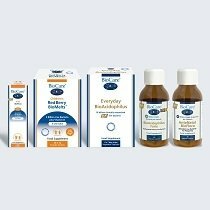 As people are all different, at BioCare we provide a wide range of vitamin supplements in different combinations, potencies, forms and absorption rates – our Nutrisorb® liquid vitamins are particularly popular. Browse our full range of vitamins, or find out more about the important role they play in our health. Each vitamin has a vital function to perform in our bodies – so a deficiency in any can have a potentially detrimental effect on our health. This is particularly so for elderly people who may experience age-related decline in their absorption capacity, or people following specific diets – for example, vegans can suffer vitamin B12 deficiency. Knowing whether you are getting the optimum level of vitamins can be difficult to determine. Some people choose to take a daily multivitamin to ensure they are getting the right amount, while other people feel that they need to supplement a specific vitamin. 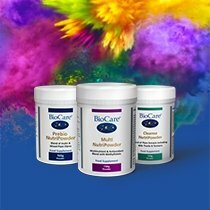 The BioCare range offers a full variety of options to cover every need. Vitamin A is important for our immune system and cell development. Our Vitasorb® A provides vitamin A in a simple liquid form, which is particularly helpful for people with dietary intolerances. Vitamin B is actually a number of different vitamins from B1 to B12, and the BioCare range offers B vitamins individually and as complexes, in both capsule and liquid form. Vitamin B9 – or folate – is particularly important in pregnancy as it helps support growth, and both vitamin B6 and B12 play a key role in controlling homocysteine level. BioCare also produces a range of methyl B vitamins, such as methylfolate, which means they are already active and ready for the body to use. Vitamin C is an antioxidant that supports the immune system, energy production and connective tissue integrity such as collagen. 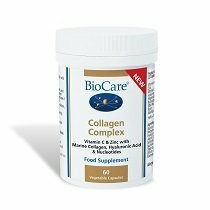 BioCare has a range of vitamin C options – tablets, capsules, powders and liquids, and most of our vitamin C products are buffered, making them gentler on the stomach. Vitamin D helps calcium absorption and healthy bone growth. The body generates most of its vitamin D from the skin being exposed to sunlight, so in the winter months it is possible to become deficient. Our best-selling Nutrisorb® Liquid BioMulsion® D is an emulsified liquid, which makes its absorption particularly effective. Vitamin E is another antioxidant and studies have shown people eating a Western diet can become deficient. At BioCare, we offer vitamin E in both capsules and highly absorbable liquid form. Discover our full range of vitamin supplements below and find the best ones for you now.